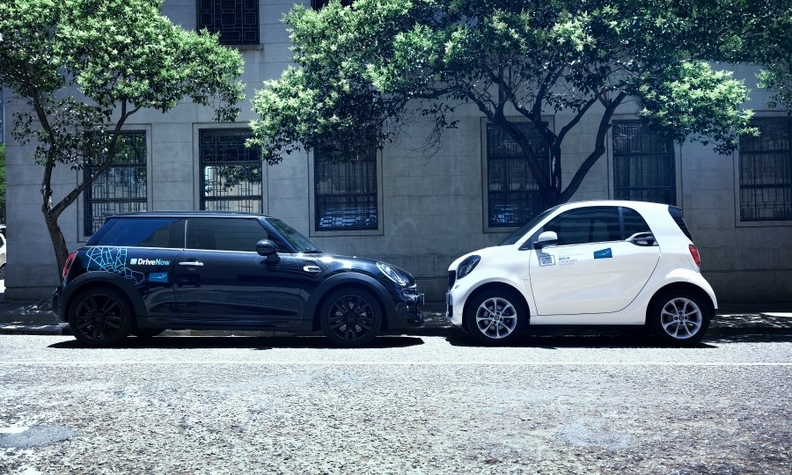 Daimler's Car2Go service (right) will combine with BMW's DriveNow unit (left) as part of the joint venture. BERLIN -- Daimler and BMW unveiled a joint ride-hailing, parking and electric-car charging business on Friday to compete with mobility services provided by Uber and other tech companies. The automakers said they would invest more than 1 billion euros ($1.13 billion) to expand the joint venture, shifting beyond building and car sales towards pay-per-minute or pay-per-mile systems. "Further cooperation with other providers, including stakes in startups and established players, are also a possible option," Daimler's CEO Dieter Zetsche said. Daimler's Car2Go car-sharing brand will be combined with BMW's DriveNow, ParkNow and ChargeNow businesses, with both automakers holding a 50 percent stake in the venture. The new venture has five strands: ReachNow, a smartphone-based route management and booking service, ChargeNow for electric car charging, FreeNow for taxi ride-hailing, ParkNow for parking services and ShareNow for short-term rental services. "These five services will merge ever more closely to form a single mobility service portfolio with an all-electric, self-driving fleet of vehicles that charge and park autonomously," said BMW CEO Harald Krueger. Consultancy PwC has said automakers face marginalization by cash-rich technology firms unless they develop services based on vehicle usage. Established ride-hailing firms have been expanding. China's Didi Chuxing aims to build its business in Latin America and Uber is gaining a stranglehold on its U.S. market.